FEAT, an evening of adventure sport-themed talks, has crossed continents and the Atlantic Ocean to land in Canada for the first time. The first FEAT Canada evening will take place as a part of the Vancouver International Mountain Film Festival (VIMFF) Fall Speaker Series in mid-November. Fascinating Expedition & Adventure Talks (FEAT) was first held in South Africa a year ago. In this time there have been three FEAT events, presented in the cities of Johannesburg and Cape Town. Created by adventure racer Lisa de Speville, FEAT invites speakers from a range of adventure disciplines to talk on recent accomplishments and expeditions. It’s a fast-paced, slideshow-based presentation format where each speaker has only seven minutes to tell their story. Far removed from a formal speaking platform, FEAT is social and fun and the audience is encouraged to interact with speakers; ooohhhs, aaaahhhs and laughter colour the theatre. FEAT Canada’s line-up of nine speakers includes Gary Robbins, Jen Olson, Kevin Vallely, Megan Rose, Nicki Rehn, Paul Gleeson, Philip McKernan, Scott Frandsen and Sebastian Salas. They’ll speak of adventurers and expeditions in the disciplines of rowing, cycling, mountain climbing, ultra-distance running, skiing and mountain biking. 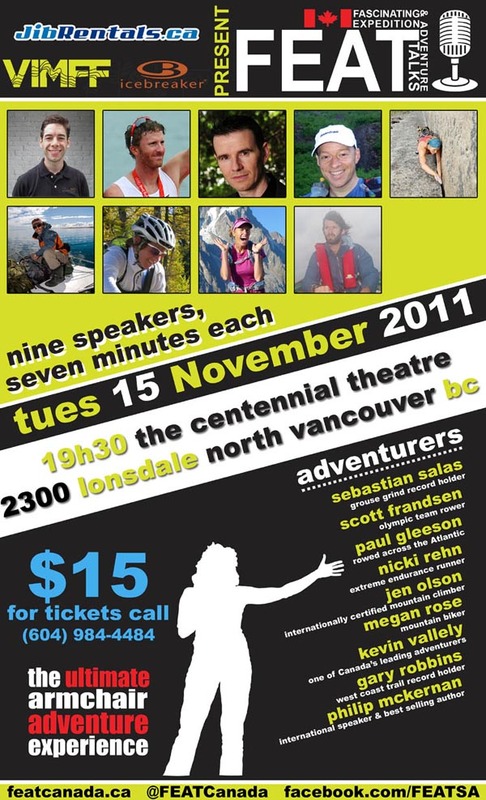 FEAT Canada will be held on Tuesday, 15 November 2011 at The Centennial Theatre in Lonsdale, North Vancouver, British Columbia. Tickets are $15 and they can be booked by contacting (604) 984-4484. FEAT Canada is made possible by the Vancouver International Mountain Film Festival (VIMFF) and sponsors, JibRentals and Icebreaker. You’ll find FEAT Canada on the web at www.featcanada.ca. There’s the speaker line up as well as links to videos of talks from the FEAT South Africa events. FEAT is also on Twitter (@FEATCanada) and Facebook (FEATSA).